I was born in Huddersfield, West Yorkshire in 1949. I have been married since 1973 to my wife Kathy. We have two sons and five grandchildren. Both sons James and Robert now live with their families in Hong Kong and are senior directors with international financial institutions. I officially retired at the end of April 2013 from Hewlett Packard having worked there for the last sixteen years. Throughout my working life I have been involved in sales and marketing in one way or another although I started my working life in electrical engineering in power supply. Since then the main companies I have worked for being, Johnson and Johnson, Campbell's Soups, Hertz, SmithKline Beecham, Synstar and HP. My family and I first moved to Wokingham in 1981, first living on Woosehill and since 1988 living at Old Woosehill Lane. Both our boys attended the Hawthorns School on Northway, followed by the Forest School, then Plymouth Business School. Like many parents at the time I became involved with the PTA which in turn led me to my involvement with Scouting in Wokingham with the 1" Woosehill Scout Group. I served in a number of roles on the Executive committee eventually becoming the Chairman leading the fundraising and building the HQ that is in Chestnut Avenue. Finally, I was a Trustee of the building for a further five years until the loans were paid off. My Scouting involvement continued in a uniform capacity, first as a District Scout Leader, and later Assistant District Commissioner for the Scouts, then ADC for the Scout Fellowship in Wokingham. I am a past member now of the Wokingham Scouts Active Support. I have been an active participant in the Wokingham Winter Carnival each year for at least fifteen years becoming Chairman in 2017. During the whole of my time in Wokingham I have been an active participant in the various resident’s associations, taking leading roles in fighting for the rights of my fellow residents in areas of the environment, road safety and child welfare. I was initially co-opted to join Wokingham Town Council in July 2003 and I also represent the Town Council on the Emmbrook Village Hall committee. I was elected Leader of the Conservative Group on Wokingham Town Council in 2008 and did that until 2015 when l became Wokingham Town Mayor. As now a past Mayor l continue to support many Town based activities and organisations. 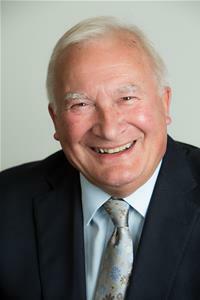 In 2004, I was elected to Wokingham Borough Council as member for Emmbrook Ward and have since served as ICT Champion until 2008 when I became the Chairman of the Audit Committee, which continued until January 2014, when I became the Executive Member for Regeneration and Community development with the further responsibility for Council Assets. I stepped back for this role in 2016 though remained on the Regeneration Project Board. In 2017 l stepped up once again to be Deputy Executive Member for Regeneration and Economic Development, taking on the full Executive responsibility once again in May 2018 along with Town Centre Highways. In Spring 2018 I was appointed as a Non Executive Director of Optalis Board. I look forward to continuing to serve the residents of Wokingham.